Clear skies. Low 58F. Winds S at 5 to 10 mph..
Clear skies. Low 58F. Winds S at 5 to 10 mph. Long Island rock band The Lemon Twigs were founded by two brothers in high school, who trade off lead vocals/guitar and drums based on who composed each song. Their schoolmates join them for live shows, playing music remeniscent of the classic rock sound of 60s baroque pop and 70s power-pop art-rock. They released their second album Go to School this past August, 2 yeas after their debut album Do Hollywood. The Lemon Twigs have played Glastonbury, Outside Lands, Lollapalooza, Austin City Limits and have opened for Phoenix, Arctic Monkeys and Sunflower Bean. The Lemon Twigs come to the El Rey Theatre with Jackie Cohen on Tuesday, February 5th. Australian singer/songwriter Dean Lewis is best known for his debut single “Waves”, but reached number one down under with “Be Alright” last year. The Island Records artist was musically inspired after watching a live Oasis DVD, and his passion for writing and performing saw success with five ARIA nominations for songs off of his EP Same Kind Of Different and consistent Triple J rotation. Dean Lewis’ first show at the El Rey sold out so quickly, another date has been added for February 12th, joined by SYML. Mexican singer and experimental composer Juan Son is known for his vocals in alternative rock band Porter, as well as his collaborations with Simone Pace from Blonde Redhead and AEIOU. His style is described as “a beautiful concoction of confident lyricism, squeezebox rock, Mexican folk, electronic tinkering, and theatrical dance music.” Juan Son uses sound sampling, voice effects, wordless chanting and writing in three different languages, securing him a Latin Grammy nomination for Mermaid Sashimi and festival spots on Coachella, Sonar, Vive Latino and SXSW. 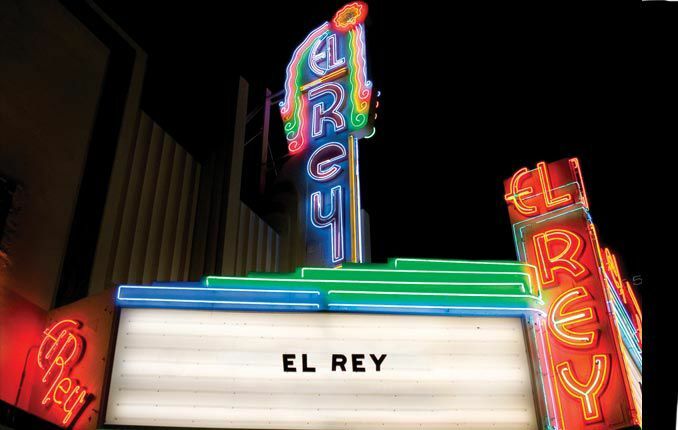 Juan Son is joined by Y La Bamba at the El Rey on Saturday, February 16th. Big band goes bass with a dose of hip hop. Brooklyn duo Brasstracks create brass-driven funk/soul, appealing to jazzheads and hip hop fans with trumpet and drums that create a unique, euphoric sound. Their self-described “future brass” music blends electronic sounds and samples with hip hop, R&B and jazz, collaborating with Chance the Rapper, 2 Chainz, Lil Wayne, and Anderson .Paak. In 2018, Brasstracks gave us For Those Who Know, and just released their latest single “I’m Alright” last week. On Thursday, February 21st, Brasstracks are joined by KEMBA and Pell at the El Rey Theatre. French Canadian singer-songwriter and pianist Coeur de Pirate has been credited with “bringing la chanson française to a whole new generation of Quebec youth.” She has collaborated with Julien Doré, Bedouin Soundclash, Peter Peter, Simple Plan, Nouvelle Vague, Lights and Against Me! and remains an advocate for the LGBTQ community. This will be Coeur de Pirate’s 3rd performance at the El Rey Theatre, and this time she brings Loud Forest to the El Rey on Tuesday, February 26th. , and here are some of the shows we’re most excited for this February. Long Island rock band The Lemon Twigs were founded by two brothers in high school, who trade off lead vocals/guitar and drums based on who composed each song. Their schoolmates join them for live shows, playing music reminiscent of the classic rock sound of 60s baroque pop and 70s power-pop art-rock. They released their second album Go to School this past August, 2 years after their debut album Do Hollywood. The Lemon Twigs have played Glastonbury, Outside Lands, Lollapalooza, Austin City Limits and have opened for Phoenix, Arctic Monkeys and Sunflower Bean. The Lemon Twigs come to the El Rey Theatre with Jackie Cohen on Tuesday, February 5th. Dean Lewis’ first show at the El Rey sold out so quickly, another date has been added for February 12th, joined by SYML. Mexican singer and experimental composer Juan Son is known for his vocals in alternative rock band Porter, as well as his collaborations with Simone Pace from Blonde Redhead and AEIOU. His style is described as “a beautiful concoction of confident lyricism, squeezebox rock, Mexican folk, electronic tinkering, and theatrical dance music.” Juan Son uses sound sampling, voice effects, wordless chanting and writing in three different languages, securing him a Latin Grammy nomination for Mermaid Sashimi and festival spots on Coachella, Sonar, Vive Latino and SXSW. Juan Son is joined by Y La Bamba at the El Rey on Saturday, February 16th. Big band goes bass with a dose of hip hop. Brooklyn duo Brasstracks create brass-driven funk/soul, appealing to jazzheads and hip hop fans with trumpet and drums that create a unique, euphoric sound. Their self-described “future brass” music blends electronic sounds and samples with hip hop, R&B and jazz, collaborating with Chance the Rapper, 2 Chainz, Lil Wayne, and Anderson .Paak. In 2018, Brasstracks gave us For Those Who Know, and just released their latest single “I’m Alright” last week. On Thursday, February 21st, Brasstracks are joined by KEMBA and Pell at the El Rey Theatre. French Canadian singer-songwriter and pianist Coeur de Pirate has been credited with “bringing la chanson française to a whole new generation of Quebec youth.” She has collaborated with Julien Doré, Bedouin Soundclash, Peter Peter, Simple Plan, Nouvelle Vague, Lights and Against Me! and remains an advocate for the LGBTQ community. This will be Coeur de Pirate’s 3rd performance at the El Rey Theatre, and this time she brings Loud Forest to the El Rey on Tuesday, February 26th.